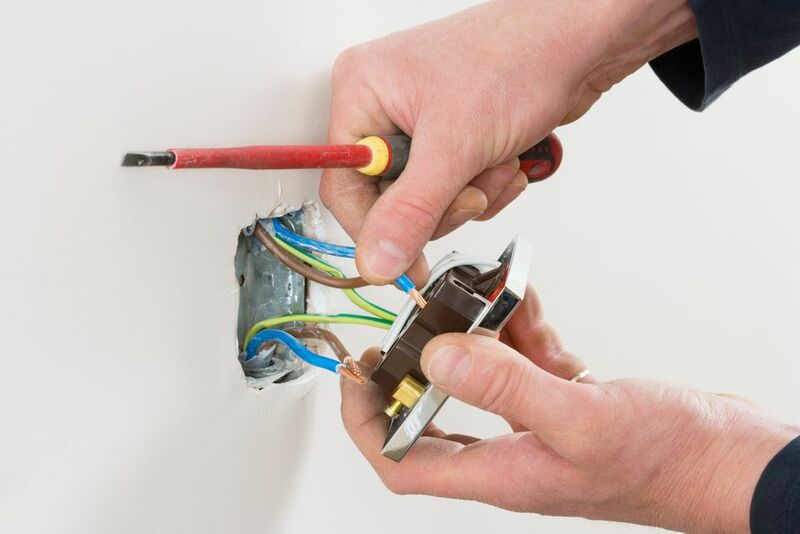 Many homeowners will call in an electrician for advanced jobs like running a new circuit or adding a sub-panel. But electrical outlet problems are a different matter, as they can be solved quickly and inexpensively by most homeowners. In fact, permitting may not even be a hindrance. In most municipalities, homeowners are allowed to fix or make one-for-one repairs and replacements of outlets, without applying for a permit. The reason these fixes are typically cheap and easy is that the problem tends to be localized. If you imagine, with some fear, that the issue involves pulling down drywall to access electrical cable or crawling around attics, this often is not the case. The source of the problem might be only at the outlet end or the service panel end. As a result, access is easy and components are simple to purchase at your nearest home center. Before working on an outlet, turn off the circuit breaker on the service panel. Test the outlet with a voltage tester to double-check that it is not powered. If you feel unsafe in any way, call in an electrician. Check whether this is a GFCI outlet. If so, press the reset button. Go to the electrical service panel and see if the circuit breaker controlling the outlet has flipped off. If it has, flip the breaker in the opposite direction, then back again in the correct position. Go back to the outlet and check all upstream (line) outlets on the same circuit between the affected outlet and the service panel. If any of these outlets are a GFCI outlet, they will affect all outlets that are downstream (load), even if those affected outlets are not GFCI outlets. If so, reset that GFCI outlet or replace it. Remove the faceplate of the outlet that is not working, after making sure that the circuit is turned off. Check that all of the wires are properly connected to the outlet and that all pigtailed wires are firmly connected under wire nuts. Bare copper or green plastic-coated wires are ground wires; they will generally not cause an outlet to stop working. Rarely will conventional, non-GFCI outlet fail, but this does happen sometimes. If you believe this is the case, replace the outlet with another, similar outlet. This is an issue of vital concern and usually will require replacement of the outlet. Remove the outlet cover, then the outlet itself. Assess whether all the wire ends all firmly connected. Disconnected wires touching each other will produce sparks and flip a circuit breaker off. If there is any doubt about the condition of the receptacle, simply replace it. It is easy enough to replace an outlet by yourself and will give you added peace of mind. Sometimes, devices plugged into an outlet cause a circuit breaker to trip. With this issue, it might be a simple case of lightening the load on a circuit. Eventually, if the problem persists and affects other parts of the system, you might need a project called a heavy-up, an upgrade from 100 or 150 amp service to 200 amp service. The most common reason for circuit breaker tripping is an overloaded system. Turn off appliances that consume a lot of electricity, flip the breaker, and try again. If the breaker does not turn off, then plug in and turn on one appliance or light and try again. Sometimes, the circuit breaker itself may require replacing. Arc fault circuit interrupter (AFCI) circuit breakers are a tremendous safety improvement, but they tend to be sensitive and prone to flipping off. If you have a number of surge protectors within the home, all working off of the same AFCI circuit breaker, this may be a cause. Surge protector electrical leakage can sometimes produce nuisance tripping. If you have a fuse, rather than a circuit breaker, this itself may indicate an older service panel that is not adequate for today's standards. If the circuit breaker trips or a fuse burns out, then nearly always a series of lights and appliances will not work. In a few instances, you may have just one light or appliance on a circuit. The most notable instance of this is with an electric oven, stove, dryer, or window unit air conditioner. Since these draw a huge amount of power, they tend to be on one circuit. If this is an isolated problem with just one outlet, a defective outlet may be to blame. In this case, replace the entire outlet. If the outlet is a GFCI outlet (the kind with the on/off buttons on the face), reset the button. If it is not a GFCI outlet, there is a chance that a different GFCI outlet has been installed upstream or line (on the same circuit, but between the problem outlet and the service panel) which trips everything else downstream or load. The best way to determine if you have a downstream GFCI outlet is with a tiny, cheap device called a GFCI tester. When the plug continually falls out of the outlet, it is simply a physical malfunction of the outlet. The fast, easy fix is one that you may have already figured out. Bending the plug's prongs outward will help the wire stay in the outlet. Hardware stores often sell replacement wires for lamps that are easy to replace. Be careful about appliance cords, though, as these are not always so easy to deal with. The best fix of all is to replace the entire outlet. What Causes Electric Dryer Outlet and Cord Failures?